Yay! We’re extremely exhilarated! A brand new garden book in our possession since a week ago! Easily ordered at mphonline.com, fast delivery by courier within 3 business days and the best part was there’s a 20% discount for online purchase. No hassle at all in getting this splendid book and it costs us only RM78.92, inclusive of delivery charges, and in perfect condition too! 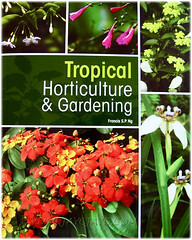 This highly acclaimed book, a soft-cover edition is none other than ‘Tropical Horticulture & Gardening‘, authored by Dr. Francis S.P.Ng, a Malaysian Consultant Botanist who was awarded the David Fairchild Medal for Plant Exploration on 6 February 2009 in Miami, USA. Visit him online at Tropical Gardening, a blog he maintains. Wow! 1,000 species of tropical garden plants…. that phrase kept beckoning me as I gaze at the MPHonline site and I knew without doubt in a jiffy that this was definitely the book I was seeking for a long time and had desired to possess. The very first few moments I held the precious book and flipped through the pages enthusiastically, I was overwhelmed with joy and astounded by the treasures it contained. The photo collage below gives you a foretaste of the eye-catching goodness that can be savoured. An awesome 361-page book, fully packed with spectacular photos of over 1,000 types of ornamental plants in tropical Asia, plus a wealth of concise information and wonderful insights on tropical horticulture and gardening. Truly impressive, outstanding and remarkable, to say the least! Not at all intimidating to ordinary and avid gardeners like us who desire to learn, understand and be mesmerized with the beauty of flora and nature. Definitely, a gem of a book to behold and possess! A more detailed review can be read at Akademi Sains Malaysia and you may be shocked to see the stated price as RM260, probably for the first publication, I deduced. My beloved John and I are so excited! Tropical Horticulture & Gardening will undoubtedly be a valuable reference and resource book for us as we aspire to continue building this garden site into an impressive resource centre for like-minded gardeners in the local and international community. 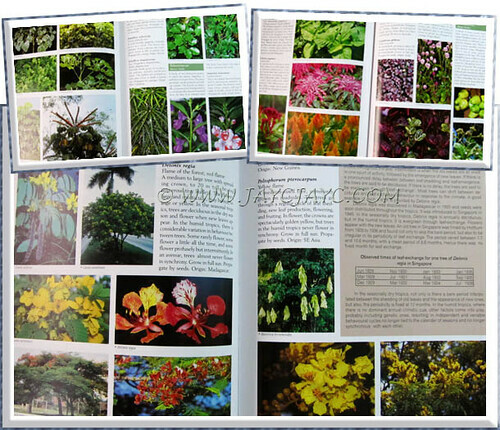 With more than 1,000 images available, mostly of garden plants in Malaysia and tropical Asia, this book will definitely be a great reference and guide, especially in identifying our local plants. Browsing through, we’ve come across so many familiar plants whose identities we haven’t known before and we’re so delighted as that would cut down many unnecessary hours of googling and thus precious time saved! Many visitors to this site have contacted us to help identify their plants, little realizing that we’re just as clueless as them. Fact is, we’re not botanists but just ordinary folks who are passionate about gardening, plants and the like. Hence, whatever plants displayed at our website have been identified through many hours of online research, mostly based on images available via google search. Of course, there are times when we’re up against the wall and in desperation to ID them, we’ve tried contacting the experts. One recent enquiry was from Nicola of Garden in a pot who’d like us to help ID her plant. She was most fortunate as a quick flip through the pages of our recently purchased garden book helped nailed the name of her shrub – Pseuderanthemum reticulatum (hehe…what a tongue twister!). Sharing this here just to indicate how useful and beneficial this fantastic book can be to us. Our grateful thanks to Dr. Francis Ng for presenting us with such a magnificent book on tropical horticulture and gardening. And, making the soft-cover reprint so very affordable for us ordinary folks. Truly value for money, we’d contend! Thanks too to Autumn Belle of My Nice Garden who had introduced Dr. Francis Ng in her blog and occasionally made references to his garden book, without which we would have been deprived of owning this invaluable treasure. Thumbs up for Tropical Horticulture and Gardening! Having it is like having the tropical flora within the comforts of our home as the stunningly beautiful photos contain therein seem to make the plants pop up and become alive! Thank you very much for the kind mention, my friend. I think this book is like a ‘bible’ for tropical gardeners. Yes, thank you from me too. I’d really appreciated your help. It’s so nice to be able to look at my plant (an old friend) and know its name. I think I will have to get a copy myself! It had been my pleasure, Nic! As you know, without this book, it’d been impossible to get your plant’s ID online… like looking for a needle in a haystack. You won’t regret getting a copy yourself! I was very interested in this book, as I am an avid “gardening/ horticulture book collector”. I ordered this book from mph online since early January 2012, and they have since gone from a delivery date of February 1st to simply now, still processing. I have ordered that the book be shipped to Miami. I don’t know if this is why there is a delay? I’m a little worried and disappointed so far. Sorry to read of your unfortunate experience, Amy! We have absolutely no idea about orders from overseas. You have to liaise with MPH directly as we have no business relationship with them. Hope all will turn out fine soonest for you. Hey Jacqueline. I finally got the book! I’m so pleased and thrilled, the pictures, the easy to follow format and writing. Certainly a worthy investment. I just needed a lil patience! Great to know that, Amy… I’m terribly happy for you. Thanks for updating us. I did wonder whether MPH followed through with my one-time phone call to them with reference to this post’s URL regarding your frustrations. Glad all’s well that ends well. G’day from the KImberley in Western Australia. I have been trying to get a copy of Tropical Horticulture and Agriculture by Francis Ng. When I try to pay with my credit card through MPH online my transaction gets declined. Is there any other way I can get this book through you.